Forest Stats | Allard Lumber Co. The average tree takes in 1.4 pounds of carbon dioxide and gives off a pound of oxygen for every pound of wood grown. Carbon is stored in wood. That means the tree will trap this carbon until it burns or decays. 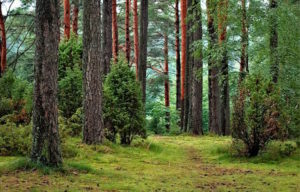 The United States has 738 million acres of forestland. Annual hardwood growth rate surpasses harvest by 70 percent. Each year 1.7 billion trees are planted in the United States – more than five trees for every man, woman and child in America – an average of 4.8 million seedlings each day. Scientists estimate lumber manufacturing consumes just 4% of the energy used by all raw materials manufacturers. Steel and concrete manufacturers consume 56%. A steel stud requires 21 times as much energy to produce and releases 15 times the sulfur dioxide as a wood 2×4. Producing concrete emits up to 3 times more carbon dioxide, carbon monoxide and hydrocarbon that lumber production. Information from the Hardwood Forest Foundation (www.hardwoodforest.org). Can foresters and industry be trusted to use sustained yield? Is wood an environmentally sensitive building material? Where are America’s trees, and who owns them? What is biodiversity and how can we protect it?